I like BBQ. No, seriously. I like BBQ…A LOT. I love BBQ. I love making my own BBQ. I love eating other people’s BBQ. I freakin’ love BBQ. There are more and more BBQ places popping up. Some good. Some bad. One of the best of the best just opened a place near where I work. Seriously. 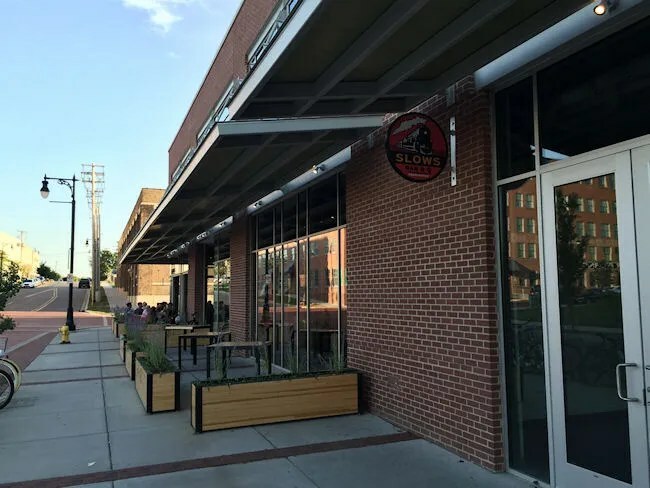 Slows BBQ…..you know the place in Detroit’s Corktown Neighborhood? They just opened a new joint in Downtown Grand Rapids….and it’s awesome. 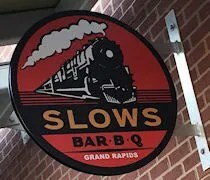 A little over a week, Slows Bar-B-Q opened it’s doors inside the Downtown Market on Ionia Street near Wealthy. Access to the new BBQ joint is both from inside the market and from the Ionia Street Side. The restaurant is actually on the south end of the Market at the corner of Ionia and Logan Street. During Market hours, you can enter from either, but once the Market closes, you have to enter from Ionia. 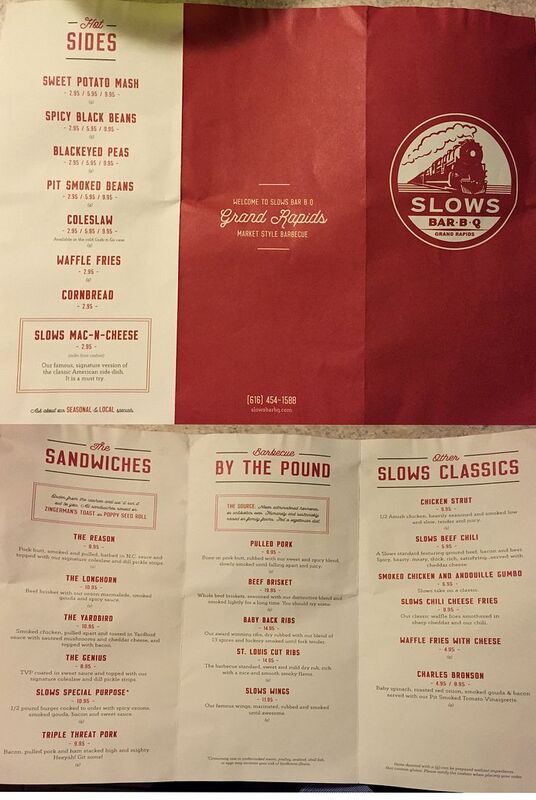 I’ve had a love affair with Slows from the first time J and I ate at the original Detroit location way back in 2009. It’s so worth the drive to Detroit just to eat at Slows, but we never made it back nearly as often as we wanted to. The BBQ is just so damn good. The Grand Rapids location is quite a bit different from the Detroit store. The big thing is that there is no table service for food. The restaurant is set up market-style….which makes sense seeing as how it’s in the Downtown Market. For those of you familiar with Arcadia Ales in Kalamazoo, it’s pretty much just like that. The night I stopped in, the restaurant was packed. All of the tables inside and out were full as was the bar (which has a huge craft beer draft list by the way), but the line to get food was non-existent. I walked right up to the counter, which is divided in to three separate stops, to order my food. The first stop is the sides section. Here you can order all the sides except the Slows Mac-N-Cheese. That’s ordered at the register and since that’s what I wanted, I skipped this and went straight for the meat. The meat options are sold by the pound. There is also options for sandwiches, but again, these are sold and ordered at the register. If you just want meat (ie. pulled pork, brisket, baby back ribs, St. Louis ribs, or wings), you order these, again, market style. Everything is sold by the pound and weighed out right in front of you. I was looking for some brisket. I ordered a half pound and the weight came out to just a little over that. The man cutting the meat showed me what he had. He showed the really tender points and some of the firmer meat from farther and the middle and asked what I would like. I told him to mix it up and give me a little of each so that’s what he did. I grabbed the box of brisket and headed to the cashier to pay. At this point, I also added on that side of Slows Mac-N-Cheese. The brisket and side cost a little over $16. 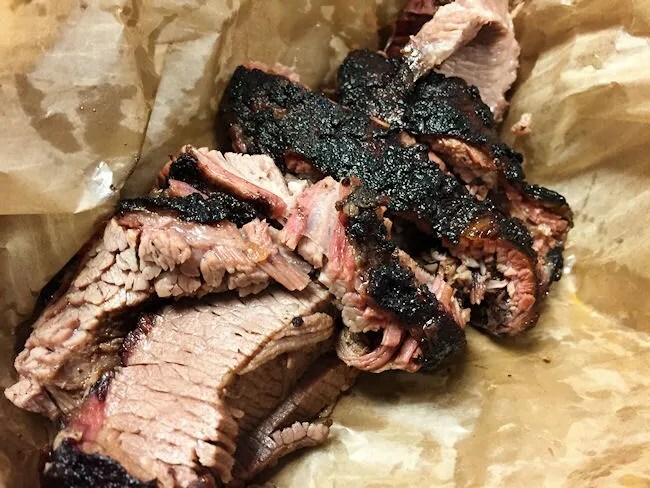 The brisket is their most expensive meat coming in at $20/lb…but I do like a good brisket and I still haven’t mastered making it myself yet, so I’ll gladly pay someone that knows how to do it right. Of course, when I got back to work, my co-workers were….pardon my French….pissed at me for not telling them where I was going for dinner. 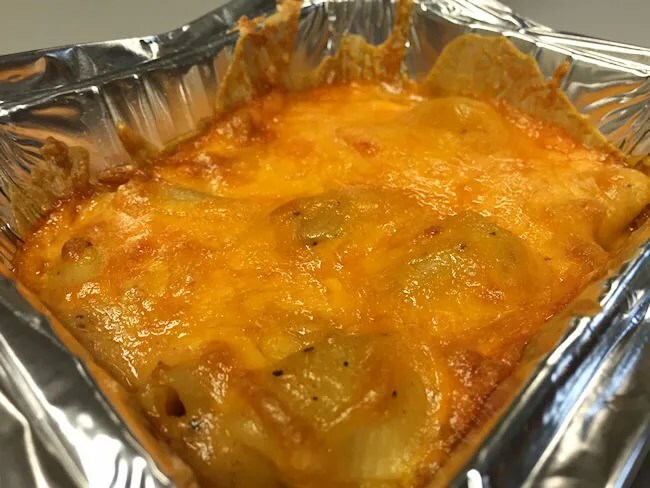 I tried to hide in the break room and not sit at my desk, but eventually, the smell of BBQ wafted through the rest of the building and angry co-workers were showing up trying to steal my dinner. I started with the brisket first. So tender. So smokey. So delicious. I don’t know how else to describe it short of saying it’s perfect. The tender, fattier parts were more of my thing, but I did like everything that was on the plate in front of me. It all had that delicious smokey crust and none of it needed any of the BBQ sauce I grabbed. Hell, I didn’t even open the the small to-go cup of sauce, I just ate the meat as presented to me and I wanted more…so…much….more. As for the Mac-N-Cheese. Seriously? What I can I say about that? It’s cheesy. It’s kinda spicy…and holy cow is it delicious. The few times I’ve eaten at Slows, we’ve always gotten this as a side, but this Mac-N-Cheese is good enough to be eaten as an entree….even though that’s not an option at this location. Slows Bar-B-Q Grand Rapids is way to accessible for me. It’s too close to work and while it can be on the pricey side, it’s worth every penny. I can tell you in the week or so it’s been open, I’ve had to show a lot of restraint to not eat there every single night. I really like this market-style concept and the delicious BBQ they serve up (and we eat at Arcadia pretty regularly for the same reason). I like that it’s not a full service restaurant just because it’s easier to get in and get out this way. I can stop on a whim and not have to wait a couple of hours for food…and I really, really like that.